HUNTING SEASON BEGINS OCT 2nd! There’s something about an old familiar shotgun that has served through numerous hunting seasons now past. Having travelled through countless fields, forests, and meadows, it bears a treasure of stories and experiences over the years. Just imagine if the old shotgun had a recording device in it that would replay all the conversations of good friends together in the field, the calling of gundogs some present and some past. And the ringing out of shots at elusive quarry, a symbolic salute to the times we have spent doing what we love. A few years back, my son came back from a duck hunt. He was a little disappointed because he and his hunting partner were just a couple ducks shy of their limit. I said to him, “You may not realize this now but someday you will. It’s really not about what or how many you got. It’s about just being there.” As we begin yet another hunting season, we at Game Creek hope that you will truly enjoy “just being there”. We look forward to seeing you all. Call 856-769-0035 to book your hunt today! Call the Clubhouse to learn more! HUNTING SEASON BEGINS OCT 1ST! What makes us a unique hunting operation . . . When you hunt here, you are not “buying birds”. You are investing in a high quality outdoor sporting experience. Our operation consists of seven different farms. Upon your arrival, your hunting party will have exclusive access to one of our farms. The farms are located within a two and a half mile radius of the clubhouse. We work hard all year long at strategically creating and managing cover and habitat that is most conducive to sustaining gamebirds (and other wildlife). We are genetically selective about the wildness of the pheasants, quail, and chukar partridge that are being released into the wild on our farms. As a result, you will find that the birds adapt well to the wild and provide a flight performance that will make you gulp when you miss. Our members and clients are our friends. That’s why they’ve been coming here for over thirty years. We are Game Creek Hunting Farms. 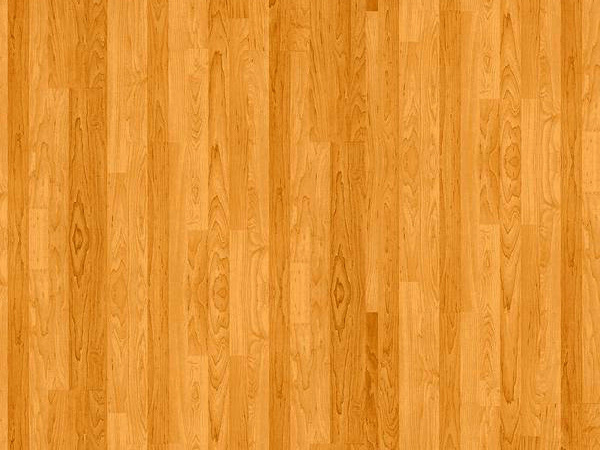 We hope you had a nice and relaxing summer. As we write this email, the temperature is dropping and there is a crisp excitement in the air with the approaching hunting season. 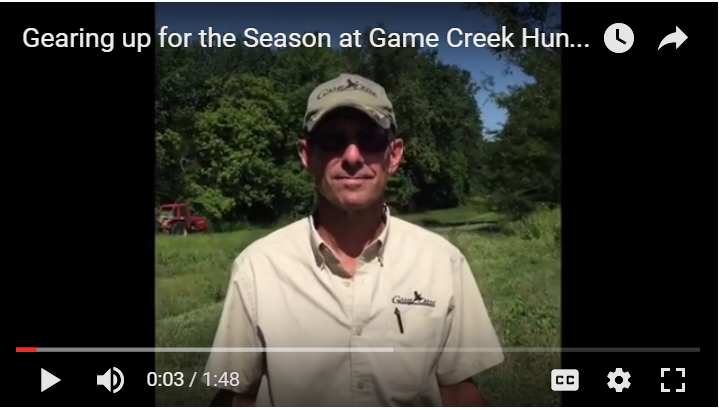 Game Creek will open for a new season on October 1st. Please visit www.gamecreek.com throughout the year for details in regards to membership opportunities, private continental shoots, special events, and cabin rentals. 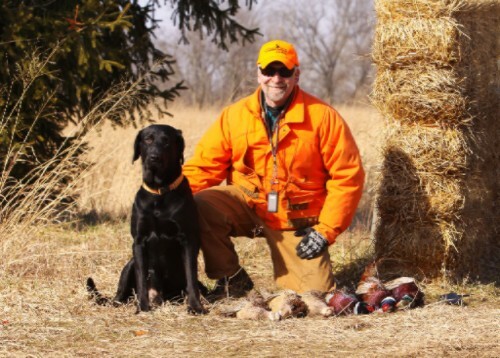 Game Creek now offers a new Gun Dog Development program for those who wish to have hands on assistance with training their bird dog, particularly those in the early stages of development using the Ronnie Smith training methods. Contact trainer Carman Daddario directly at 609-501-8359 for specifics. Saturday, October 17th: Shoot for a Cure - Cystic Fibrosis Benefit Continental Pheasant Shoot, Silent Auction, Wobble Trap Competition, and Pig Roast. This is a great chance for the hunting community to have a positive impact as the proceeds will go to research for a cure for Cystic Fibrosis. Please visit http://shootforacure.passioncff.org to register or call the Foundation's director Robin Paterson (rpaterson@cff.org 610-325-6001) for sponsorship opportunities. Feel free to contact the Game Creek office for additional information on this special event. Friday, November 27th: Thanksgiving Weekend Continental Pheasant Shoot.. Follow up the holiday with some exciting wing shooting action with your family and friends. The shoot will begin at 1:30followed by a full buffet dinner. The cost is $245 per gun, 10 high flying pheasants each hunter. Two paying hunters may be accompanied by a Junior hunter (under 18) in their blind at no extra charge. 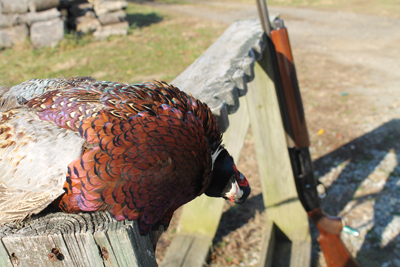 Saturday January 16th: Cabin Fever Pheasant Shoot and Wild Game Dinner. A Classic Game Creek Tradition with high flying pheasants and a delicious wild game feast prepared by chef Jeff Lapp. This one fills up fast, reserve early. Cost is $245 per gun. As always we can tailor a private shoot or special hunting event for your friends and family. Remember to bring the non-hunting ladies for a tour of the local wineries and vineyards. *If your headed to the Ocean County Gunning and Decoy show next weekend, visit our tent near the bird dog competition area.